Alexander Papagos was born December 9, 1883 in Athens, Greece and died there October 4 1955. Papagos studied at the Brussels Military Academy along with the Ypres Cavalry School finally joining the Greek Army in 1906. Starting as a Cavalry 2nd Lieutenant Papagos quickly rose through the ranks until he reached the position of Minister of War in 1935. Shortly after he was promoted to army chief of staff. During World War II Papagos was Commander in Chief of the Greek army but was captured by Nazis. In 1950 he resigned from his military position and two years later took up the position of Prime Minister of Greece under his new party, The Greek Rally, until his death. Recognized as one of the biggest military figures in Greek history, Alexander Papagos faced many challenges to get on top, and become what he was best at, the military. He studied in the Brussels Military Academy and the Cavalry School at Ypres, joining the Hellenic Army in 1906 as a Cavalry 2nd Lieutenant. Served in the first Balkan war as a junior officer in the general staff of King Constantine when he was only 23 years of age, fought in Macedonia from November 1912-March 1913 as a captain and held a succesive campaign in Siege of Yannina. Served in many campaign such as the Asia Minor Greek campaign, but because of the horrible campaign, was dismissed and forced out by by a revolutionary council headed by Nikolaos Plastiras. 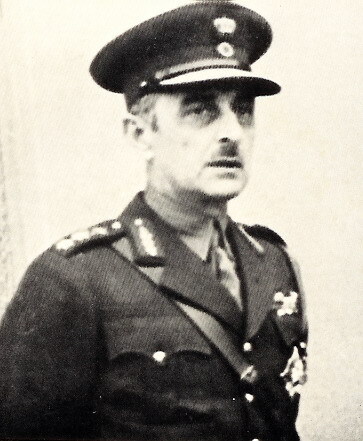 He was again recalled in 1927 with the rank of Major General and promoted to Lieutenant General in 1931 and Corps Commander in 1934. 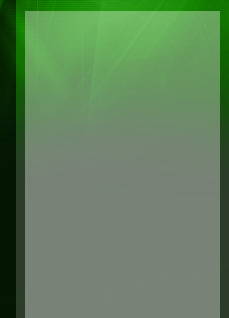 Appointed minister of war in the Georgios Kondylis, Konstantinos Demertzis and Ioannis Metaxas governments. During WWII the German military try invading Macedonia in April 6th of 1941, Papagos and his Greek army opposed, but unfortunately the greek forces where outnumbered, and outflanked by the strong German army. In result to this failure, Papagos and many other greek generals, and soldiers were captured and taken to Germany, In April 1945 he was transferred to Tyrol together with about 140 other prominent inmates of the Dachau concentration camp, where the SS left the prisoners behind. He was liberated by the Fifth U.S. Army on 5 May 1945. During 1945 Papagos returned to Greece, rejoined the Army and became general again in 1947. During the Greek Civil War on January 1949 Papagos was appointed Comander in chief to defeat the communists, defeated the communists, however, Americans helped on the cause by sending extensive aid and a napalm eqquiped aircraft. 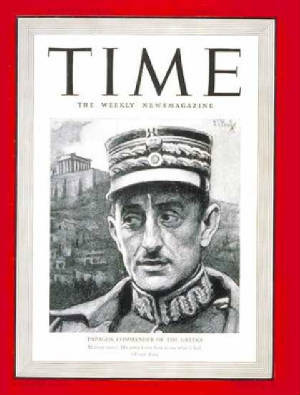 On October 28th 1949 he was awarded the title of Marshal, his military career is the only one to ever receive this title in all Greek history. Studied at the highly revered Brussels Military Academy and the Cavalry School at Yprees, joined Greek army as a cavalry second lieutenant. Served under King Constantine as the general staff as well as holding a caption position in the first Balkan War. 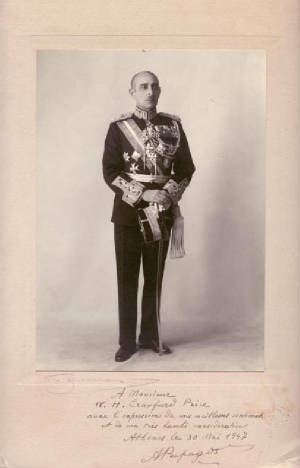 Papagos was dismissed from the Greek army in 1917 for being an established royalist, but was recalled when king Constantine was brought back into control. In 1923 he was decommissioned as a result of the 1922 Revolution. He was recalled in 1927 to the status of Major General and was later promoted to Lieutenant General and Chief of the Army. With the out break of the Greco-Italian War in September 1940, he directed the Greek army against Italian forces along the Albanian border. He was able to halt the offensive attack of the Italian forces and drive them back to Albania. After the Italians second futile attempt, Papagos was forced to maintain the Greek Army in Albania, and was unwilling to reinforce the northern border of Greece against an oncoming German Army. After the Germans engaged Greece, the Greeks brutally battled back but the stalemate was broken after the Germans outflanked the Greeks. The Greek government fled Greece to get away from Nazi invasion; heroically, Papagos along with other Generals stayed back to fight. He was captured and sent to Dachau concentration camp, where he stayed with his fellow Generals, until being freed by the Fifth U.S. Army. He returned to his position as Major General when he returned to Greece. He faced new adversaries this time a Communist group who threatened the Greek government; the American government because of their containment policy during the time financially backed him. During the struggle over the power of the Greek government, small splinter parties as well as weak parties fought for control. Because of his courage and his experience on the battlefield he was elected as the prime minister of Greece after the success of the Greek Army over communists. He passed away in October 1955, after a full and successful military career as well as political.